Rumors circulated that President Barack Obama was secretly a Muslim and Adil Mohammed, 57, couldn’t help but wonder: Why? Why would it be secret? Why is it a controversy? “That was looked upon as a bad thing,” Mohammed says. Faced with fear, distrust, even hatred, Mohammed knew how to best respond. Mohammed came to the United States in 1983 at age 22 to attend graduate school. He rented an apartment while attending the University of Louisville and spent time with his landlady watching evening network news. She taught him the basics to function in American society, like writing a check and addressing an envelope, and gave him an important taste of America. “That’s how I got into America, or America got into me,” says Mohammed. After completing his master’s degree in industrial engineering, he went to work for General Motors as a project manager until being laid off in 2009. He and a business partner formed Med+IT Systems in 2014 and is also in the process of developing mobile apps. “Coming from India, I was always comfortable coming from a multi-faith, multi-cultural society. I was actually in a minority. I grew up learning how to deal with other faiths and work together and be nice,” Mohammed says. “At some point in my life I made the decision that America is my home.” When that realization occurred to him he decided to plant his roots and “put himself out there” as he had learned from his upbringing in India. Within a year, Mohammed joined with a core group of four or five other Flint-area Muslims and formed American Muslim Community Services. 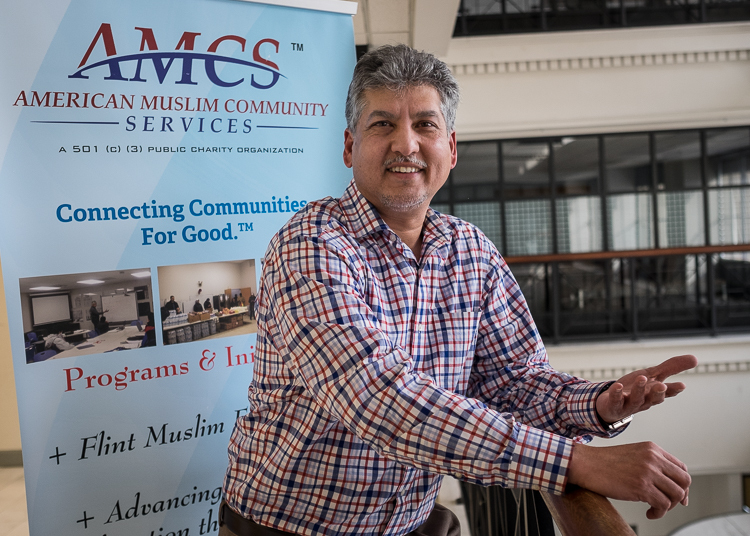 AMCS gives SAT coaching classes, offers nutritional assistance through two Flint Muslim Food Pantry locations, and operates the Muslim Outreach Free Medical Clinic. Mohammed explains the concept behind the slogan. “Everybody is part of a circle,” he says detailing two of his circles as the India Club and the Flint Islamic Center. “Let’s not just sit in our own little circle. We can still be a part of those circles but also be a part of the other communities. No one has to break out of the one to go to the other,” he says. “But you are connected. Mohammed is also the co-founder of the blossoming International Center of Greater Flint.